"Homecoming" pulled off an incredible feat in the way it introduced Hera's father, the fanatical Twi'lek freedom fighter Cham Syndulla. On the one hand, Cham threw Hera off-balance and showed us a new side of the Ghost's confident captain, deepening our understanding of who she was before she was "Captain Syndulla." On the other hand, his approach to fighting Empire prompted the Hera we all know to assert herself in a way that reinforced her reputation as a natural leader. Cham's arrival exposed a new aspect of Hera's past and forced her to grapple with it, but with brilliant execution, "Homecoming" showed her emerging from the other side of that crisis stronger than before. The way Hera's rebels behaved when they met Cham offered us our first impressions of him. Kanan's response was the most obvious. Cham was a legend to him, and so, despite being leagues more powerful than the Twi'lek, the ex-Jedi strove to impress the cell leader. He treated their encounter like a formal diplomatic affair; since Ezra was his apprentice and thus his responsibility, he endeavored to get Ezra to straighten up and make a good impression. (Kanan's defensive insistence that he wasn't acting unusual prompted the exchange, "Nothing. Just calm down!" "You calm down.") As soon as Cham appeared, Kanan adopted a formal posture and demeanor. He was so nervous that he bungled the introduction of his team mates, prompting an exasperated look from Sabine. Sabine, in turn, seemed thrill to meet Cham because she had studied his tactics at the Imperial academy. Viewers of The Clone Wars would remember Cham as the fiercely patriotic guerilla fighter who begged for Republic intervention when the Separatists invaded Ryloth and venerated the Jedi for interceding when it seemed like no one else would. But for everyone who hadn't seen those episodes, it was important to establish that, in the interim, Cham had become a Big Deal. So his haughty response to Sabine's comment—"The Empire is still trying to figure out how to beat me"—was an excellent way to establish his fame and tactical brilliance. As Cham began to interact with his daughter, however, it became clear that there was a gulf between them, a philosophical and pragmatic divide made worse by years of separation and a tense family history. This was a fantastic wrinkle to introduce into Rebels, which had not yet dealt with an obvious fact: that in this time period—prior to the creation of the Rebel Alliance that united many cells into formal fleets—the groups fighting the Empire operated largely on their own and often had clashing motives and priorities. (Another incident later would reinforce this theme.) Cham's priority was his own planet; he wanted to destroy the Imperial carrier over Ryloth to improve his people's morale. Hera, meanwhile, was thinking bigger, acting on behalf of forces larger than herself and putting aside homeworld loyalty. Cham Syndulla's fanaticism produced interesting tension with the Ghost crew, reflected continuity with his appearances in The Clone Wars, and demonstrated how much value can be added to Rebels by introducing characters from the previous series. From the moment we first met him, Cham prioritized Ryloth; by the time of this episode, he had spent decades putting his planet first. In The Clone Wars, he expressed disdain for the Republic bureaucrats who abandoned him, suggesting contempt for anyone who forgot Ryloth. His love for the Jedi came from the same place: They had helped him free his people from the Separatists. On the way to the carrier, Cham recounted his and Mace Windu's exploits during The Clone Wars's Ryloth story arc. This wistfulness about working with the Jedi reflected the fact that they had stood up for his planet when no one else had. Given all of his struggles—and given the fact that Ryloth remained oppressed after the Republic became the Empire, thus eroding all of his and Windu's hard-won gains—there was something understandable about the way Cham said, "I don't care about everyone. I care only about Ryloth." That, of course, leads us to his betrayal, another fantastic reminder of the tensions between rebel cells and the reality of tensions between freedom fighters with conflicting goals. We knew that Cham didn't like Hera's plan to capture the carrier. We knew that he was disappointed with her for joining what he considered to be a quixotic movement. But I don't know how many people expected him to betray her or the mission. Particularly on a show like this, we're accustomed to the good guys just acting like the good guys together. Both Cham's and Hera's cells fight the Empire, and so we viewed them as one unit for the purpose of this mission. But Cham's loyalty to his people outweighed any need to be diplomatic with another cell. He took advantage of Hera and her people because that was the best way to strike a blow against the Empire that would embolden his people. His betrayal was an important reminder that not everyone who calls himself a rebel sees the fight the same way. From a macro perspective, Cham's clash with Hera's team was the best part about his appearance on Rebels. But from a micro perspective, his relationship with his daughter—and the way this relationship made us reconsider Hera—brought the most to the story. Hera is the leader of the Ghost team. She is the pilot of the ship, the captain of the crew, and the most strategic operator among the main cast of rebels. She sometimes goes toe-to-toe with Commander Sato himself. She is never subservient and rarely uncomfortable. But Cham's arrival changed all of that. Cham talked to Hera like, well, a child—because that's what she was to him. He was fighting threats to Ryloth well before she was born, and he continued to do so after his wife's death created a rift between them, one that eventually led Hera to leave Ryloth. With the benefit of far more warfighting experience, plus a broader perspective on galactic affairs, Cham thought Hera's fight against the Empire was unwinnable. As a result, her faith in that fight—which was stronger than her loyalty to her family and her homeworld—wounded him. In their first private conversation, it seemed like Cham viewed Hera as a rebellious (no pun intended) child, one who was acting out because she didn't know enough about her situation. This way of looking at Hera was unprecedented; before Cham, no one could have framed her life that way. 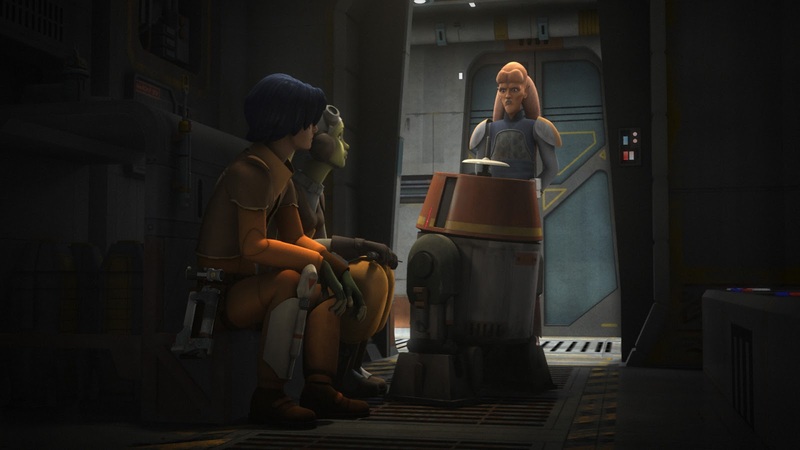 "Homecoming" capitalized well on the fact that Cham occupied this unique role as the only person who could talk down to Hera. The normally stoic captain's unusual anxiety around reuniting with her father was the clear emotional heart of the episode, and it played well in both characters' dialog and mannerisms. Two things became clear at the beginning of this episode. First, Hera didn't want to deal with Cham. Second, she recognized that the importance of mission demanded it. When we later learned that her departure from Ryloth had created the strain between them, a third fact became clear: Hera was firmly loyal to the Rebellion and would do anything for it. Not only did she leave Ryloth's fight behind to join the bigger war, but she accepted the need to reunite with her father—and reopen those old wounds—if it meant securing resources for her new "people." As those old wounds reopened, a new Hera appeared. The animators showed this by having Hera fidget absent-mindedly while she told Ezra about her father. Voice actress Vanessa Marshall showed this in Hera's initial private conversation with Cham. When Cham asked Hera about Chopper, she answered in a steady, emotionless tone, revealing the droid's name and using a male pronoun to emphasize that she cared about the droid. The subtext was clear: Hera had a new family and didn't need Cham in her life. She didn't seem to mind at all that her new family ties annoyed her father—quite the opposite, in fact. Marshall also showed us another side of Hera by adopting the typical Twi'lek pseudo-French accent as Hera defended her participation in the Rebellion to her father. The meaning was clear: Hera was getting so angry that she was slipping back into her original ways. Perhaps fighting with her father recalled old times—a time before she abandoned her accent in an attempt to shrug off her bonds to Ryloth. The sound of her fierce words in Marshall's unmistakable tone, but conveyed with a different accent, emphasized that Hera had lived an entire life before joining the Rebellion—and that part of it was still with her. While Cham was regaling Kanan with tales of the Old Republic, Hera was in the other TIE bomber pod trying not to listen. She actually seemed annoyed with Kanan for buying into Cham's mystique. Her exasperation was understandable: her familiarity with her father, from their family life together, let her pierce his legendary aura. Just as Barack Obama's daughters will never view him as the president of the United States, Hera stood outside the circle of worship directed toward Cham and grumbled as the worship occurred. When Kanan said that he saw a lot of Cham in Hera, she gave him a hard-to-decipher look, as if she wasn't sure whether to be angry or honored. In all likelihood, she didn't even know how she felt about the remark. Cham may have temporarily thrown Hera off-balance, but throughout the episode, her tenacity shone through. Not even her father could undermine her in that respect. This was apparent when she dismissed her father's plan to destroy the Imperial carrier by pointing out that, if his people could have destroyed it, they would have done so already. She could see that he was there because he needed her help with any mission to the carrier, and she used that as leverage to win the argument (albeit only temporarily, as it turned out.) By standing up to her father, Hera proved that, when it came to the strength of her personality, she was easily his equal. Later, when Cham betrayed her, Hera also demonstrated the strength of her commitment to the rebel movement. Even her love for her father didn't dissuade her from planning to take him down. Not for a moment did she contemplate letting him disrupt her mission. Her steadfast refusal to let attachments interfere with the bigger picture reminded viewers of her iron-clad priorities—and perhaps echoed the mindset that drove her to leave Ryloth in the first place. Hera reinforced a third personality trait in "Homecoming": her leadership ability. To convince her father to give up his effort to destroy the carrier, she gave a speech in which she appealed to his desire to throw off the Empire's yoke. "This battle can't be won on Ryloth alone," she said. As she made the case that all rebels needed to think big, regardless of their personal grievances, and that the rebellion was something Cham should back, she ended up swaying Gobi and Numa. Perhaps because he was then clearly outnumbered, Cham stood down. Whether or not Hera had intended to persuade her father by winning over his compatriots, that ended up working. The incident showed that Hera was both eloquent and thoughtful, capable of convincing even her fanatical father's most trusted fighters. It was easy to see why people followed her into battle. In addition to the clash between Cham and Hera, "Homecoming" episode offered other, smaller gifts to the audience. For one thing, Numa was back. Twenty years after her debut as a small child in The Clone Wars, Numa was fighting at Cham's side, offering yet another link between the two animated series. We also learned a bit more about Chopper's origin story with the rebels when Cham revealed that Hera had found him during the Clone Wars. And then there were two great scenes with Kanan and Ezra. Their Force-powered teamwork to get through the closing blast doors and take out the stormtroopers was just fantastic. It was like something you'd see at the height of the Jedi's power or during a fabled battle of the Clone Wars. Aside from looking cool to the audience, the coordination involved also indicated that the bond between the two Jedi was deepening. The second scene, in which Kanan had Ezra mind-trick the carrier's captain into giving the abandon-ship order, was both a light moment and a reflection of Kanan's insistence on field training. And as I rewatched the scene—Ezra psyching himself up for his first mind trick and failing his initial attempt—I couldn't help but wonder if it was a tiny nod to Rey in The Force Awakens. "Homecoming" depicted a fascinating and essential clash between Hera and someone who occupied a unique role in her life. By the end of the episode, they were on better terms. The moment when Cham helped Hera hold the carrier steady visually symbolized their mutual recognition that they "were always stronger together," as Cham put it. And perhaps Cham had grown to appreciate Hera's new family. He didn't know what to make of Sabine's plan to destroy the light cruiser, but maybe that plan's success prompted a reevaluation of her team. Either way, the episode concluded on a bright note. Cham remarked that Hera got her idealism from her mother, to which she responded, lovingly, that she got her leadership skills from him. In response, as they parted ways, Cham called Hera "captain," conveying his respect for her—a marker of the fact that their dynamic had changed, and their relationship had improved.